Photographers, artists, poets: show us STANDOUT. Last weekend my family definitely stood out in the crowd. Every year we come together for one big party to celebrate birthdays, cook a huge dinner and take at least one fun day trip as a group of goofy tourists. My sister Erica organizes matching t-shirts and party favors around a theme and this year’s choice was Lego. Now you know where my Wonder Woman mini-figure came from! 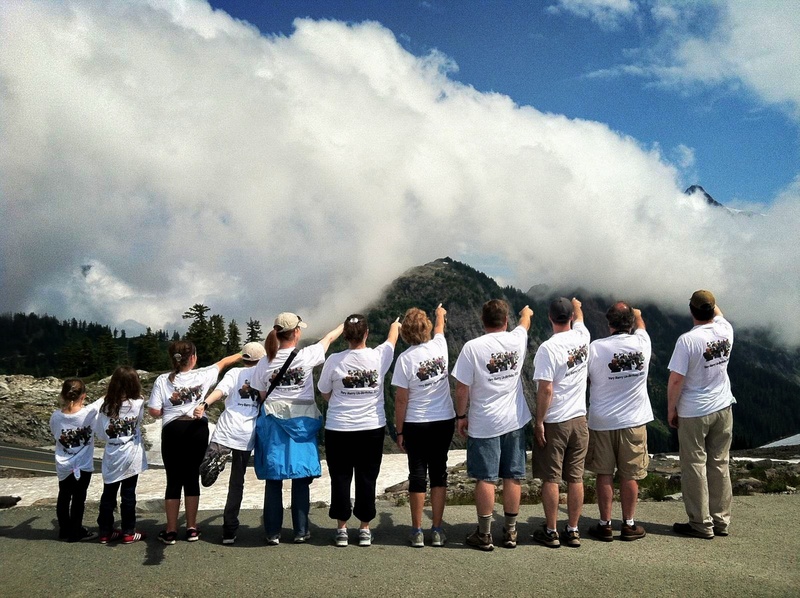 Not to be outdone by a group of 11 in the same t-shirts, pointing at a mountain, Ryan had to take it one step further and strike a pose all his own…that’s him fourth from the left on one leg. Credit for this photo belongs to Erica who blogs at the lovely Growth and Possibility. She has some beautiful photos and fun stories to share about her life and travels and if you enjoy my blog I know you will have a great time reading hers as well. What a great family event and very creative…love the shirts. I’m not a marquee kind of person. I’ve always accomplished and achieved, behind the scenes. It’s from where many tell me I’m most successful and able to contribute. I’m contented being there. What an amazing picture, Lisa! Loved it! And as far as standing out in a crowd, I’m glad I am not afraid of it. That sounds like fun. I thought the photo was pretty funny.